Oscar Jolles (he was mostly known this way, instead of Oskar) was awarded the degree of Doctor of Philosophy at Jena university in 1886, with a monograph Die Ansichten der deutschen nationalökonomischen Schriftsteller des sechszehnten und siebzehnten Jahrhunderts über Bevölkerungswesen. 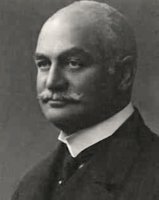 I do not know exactly when he started to work at H. Berthold Messinglinienfabrik uns Schriftgiesserei AG, or when he became a major or the major shareholder and director at H. Berthold AG, but as far as I know he had a prominent position in the company at least in the 1908–1921 period. He was also a bibliophile, but his interest was not only cultural, but also very much related to the printing, font-type and binding qualities of the books (which are still in my possession). He supported culture and arts. I understand from my father that he was fluent in the Latin and Greek languages, which were quite commonly used in old books. In summary, the information I have suggests that he was perhaps more an 18th century character than a technical innovator, but his executive position in such an important company of that time, and for such a long period, suggests that he likely was responsible for the creation of many improvements and new foundry types at that time.